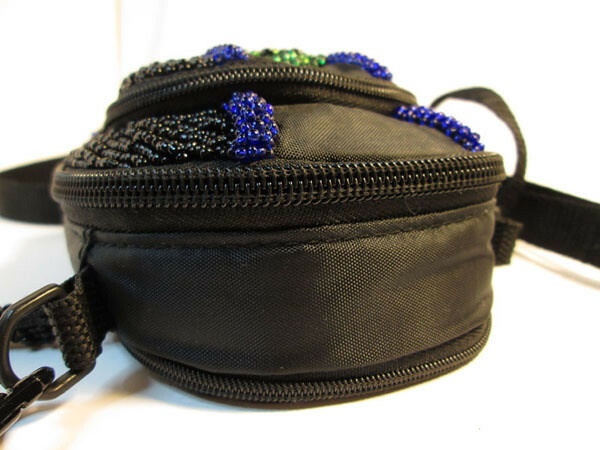 Hand Beaded Recycled Camera Case. 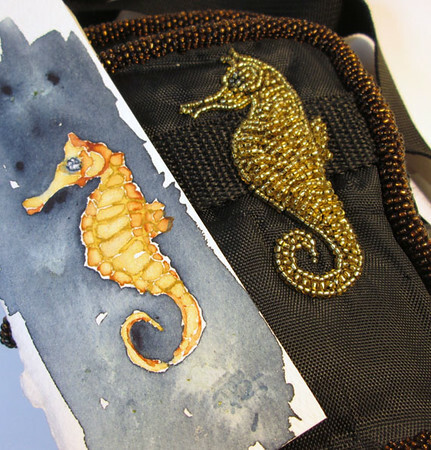 Using an original design, the little seahorse has a 3-dimensional tummy. There 2 separate zippered pockets; the one in front is about 2 inches shorter and they both about 1.5 inches thick. The larger, back pocket, has a bit of padding. The case has been carefully cleaned. While the case is recycled; there is no fraying or obvious wear to case except on the zipper tabs where the black paint is worn away. The zippers and the strap are not damaged and function normally. On the back side there is a very solid snap-down loop to attach the case to a belt. NOTE: The little design painting is sold and not included in this purchase. 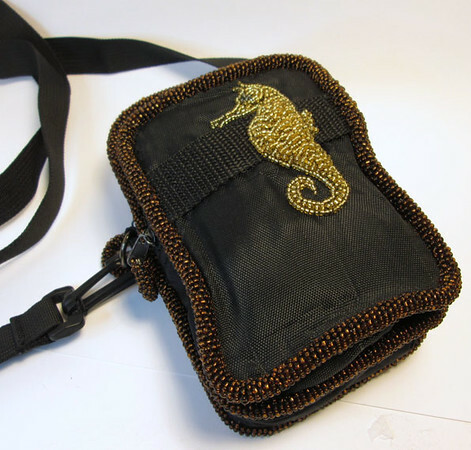 I have several of these little cases – each different – available for custom requests. 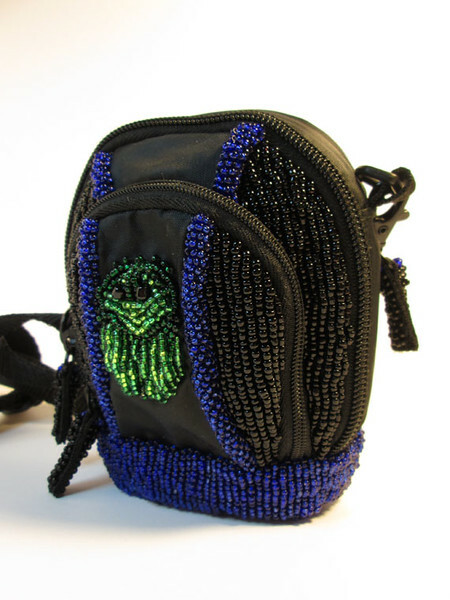 Hand Beaded Recycled Camera Case. 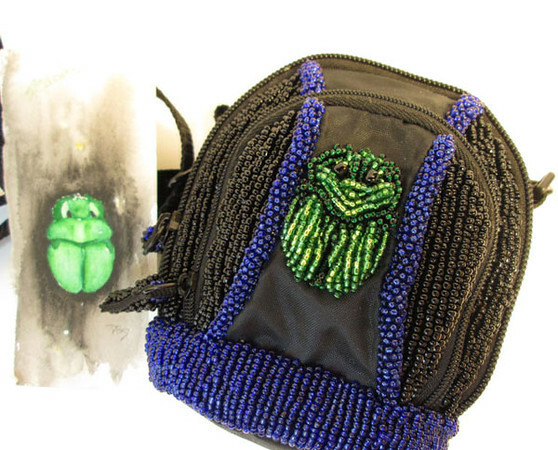 Using an original design, the little beetle is somewhat 3-dimensional. There 3 separate zippered pockets; the one in front is much smaller than the 2 back pockets (3 inches wide by 3.25 high and very thin with a little mesh pocket inside). 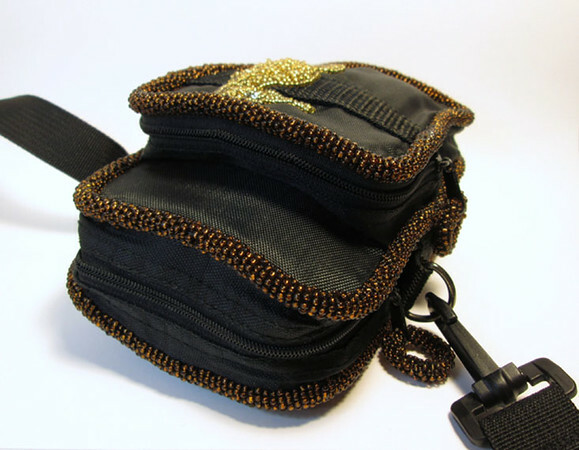 The 2 larger pockets are the same width (4.5 inches), the middle pocket is the largest (1.5 inches thick) and is well padded; the back pocket is very thin. The case has been carefully cleaned. While the case is recycled; there is no fraying or obvious wear to case except on the zipper tabs where the black paint is worn away. The zippers and the strap are not damaged and function normally. On the back side there is a loop to attach the case to a belt. NOTE: The little design painting is included in this purchase.